We think we’re in love. The New Horizons probe swivelled around after the Pluto Flyby to take a nightside snapshot of the dwarf planet. The result is both beautiful and scientifically fascinating, the very best combination. After the closest approach flyby on July 14, 2015, the New Horizons spacecraft continued soaring past the Pluto-Charon system into deep space. The spacecraft kept collecting data throughout the flyby, swivelling to keep the dwarf planet in its sights. This full-disk departing image is from when the spacecraft was 2 million kilometers (1.25 million miles) away from Pluto, close enough that you can pick out features just 19 kilometers (12 miles) across. The result is not just beautiful, but also our first look at a hazy atmosphere that’s larger than we anticipated, and holds the first hint of alien weather on the distant world. Even cooler, that atmosphere has distinct structure. The lower level of haze extends from the surface up to about 80 kilometers (50 miles) altitude, while the upper level extends another 50 kilometers (30 miles). We have no idea if this structure is from chemistry or dynamics yet, but either way it means that Pluto has weather. This haze isn’t just beautiful and surprising: it also holds clues to the complex chemistry driving so many mysteries on this cold little world. The haze is formed by ultraviolet sunlight breaking methane gas into ethylene and acetylene. When these more complex hydrocarbon gases fall lower in the atmosphere, they chill and condense into ice particles. The powerful ultraviolet radiation of sunlight keeps driving further chemical reactions, converting the haze into a rain of tholins. Tholins are the dark red hydrocarbons lending Pluto a distinctive tint in enhanced colour images. Ultraviolet radiation from sunlight breaks down methane into complex hydrocarbons in the upper atmosphere. Complex hydrocarbons like ethylene and acetylene build up in the upper atmosphere. Complex hydrocarbons fall into the lower atmosphere, condense into ice particles as haze. Ultraviolet radiation from sunlight breaks those complex hydrocarbons into tholins. The presence of haze is delightful, but not inherently shocking. Our previous measurements from Titan indicate that haze can form at extremely low pressures, although challenge the simplification of the model presented by the New Horizons team. For example, the experimental results of Sarah Hörst’s research into haze on Titan indicate that nitrogen, methane, and carbon monoxide are all involved. 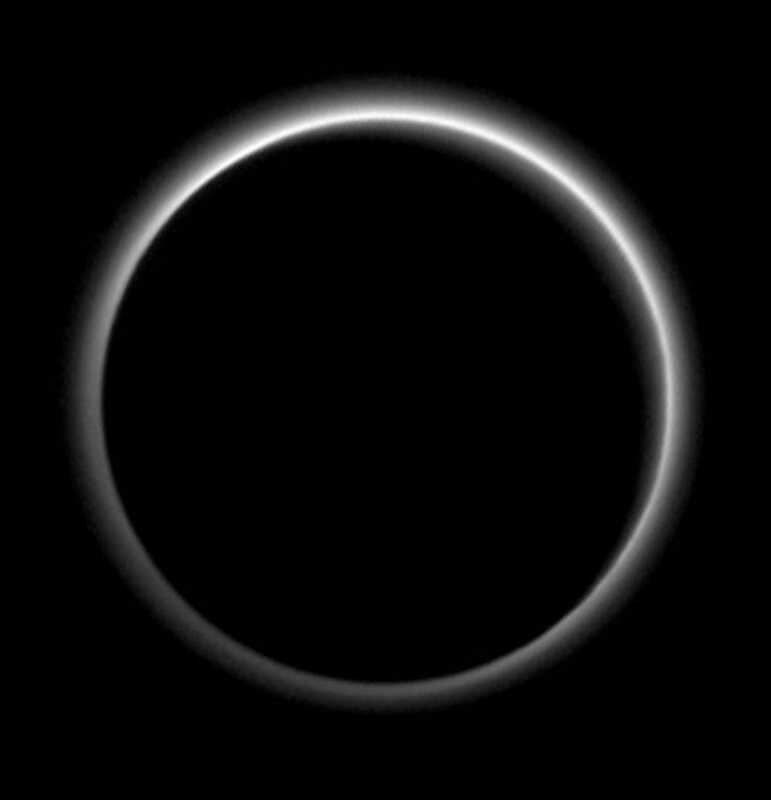 What is surprising is that this backlit image of the night side of Pluto looks suspiciously like Titan. Part of the push to get New Horizons out to Pluto was that we were attempting to see the dwarf planet before it got so far from the sun that the atmosphere collapsed. In the intervening years, we didn’t observe any indications of collapse, making us question if our theory was wrong. But now we’re seeing something different. The very first up-close measurement from the REX radio instrument indicates a sudden, sharp drop in Pluto’s atmospheric pressure within the past few years. The REX radio experiment was a whole new approach to measuring planetary atmospheres. Instead of passively listening to New Horizons or sending it new commands, the Deep Space Network actively participated by sending out radio signals to create an artificial occultation for the probe just an hour after the flyby’s closest approach. The radio waves were refracted by atmospheric gases, allowing a precise measurement of surface pressure. The surface pressure on Pluto is measured in millibars, less than a hundred-thousandth of the air pressure at sea level on Earth. That’s half the pressure predicted by our models. Either we’ve gotten very lucky and the probe arrived just in time to see a critical moment in the dwarf planet’s history, or our Earth-based measurements are going to need dramatic recalibration. Alternately, the first local measurement is ground truthing that indicates we’ve miscalibrated our long-distance measurements all these years. Honestly, it isn’t that surprising that our years of measurements from billions of kilometers away doesn’t immediately match the ground-truthed data. Luckily, we just took another terrestrial measurement of Pluto’s atmosphere using instruments on the Sophia aircraft during a recent occultation, so we’ll be able to compare measurements and see what’s going on very soon. This is also just the very first bit of data from REX: New Horizons will downlink a greater variety of measurements over the next few weeks.